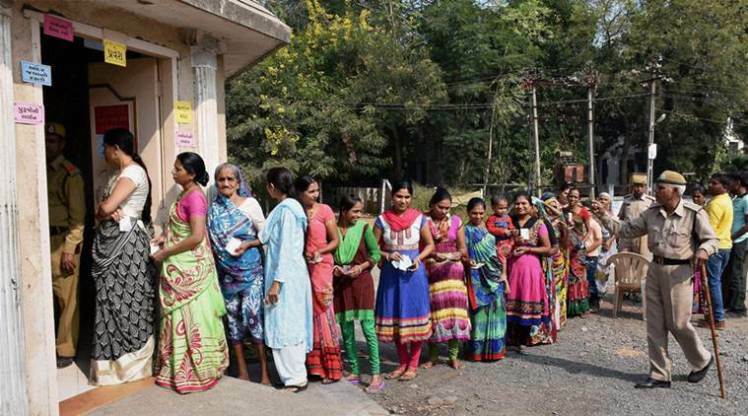 Ahmedabad: Gujarat recorded around 68 percent voter turnout on Saturday in the first phase of assembly elections across 89 constituencies in Kutch, Saurashtra and south Gujarat. The figure is lower than 2012 when 71.3 percent polling took place, the Election Commission said. There were some reports of electronic voting machines or EVMs malfunctioning and the Election Commission said faulty machines found in 7-8 booths were fixed or replaced by 11 am. Finance Minister Arun Jaitley has dismissed the Congress allegations of “a conspiracy,” saying the opposition party is staring at defeat as “voters have made up their minds months in advance”. Announcing the turnout, Chief Election Commissioner Achal Kumar Jyoti told reporters, “The final figures would come later… Hopefully the final figure will touch previous election’s figure”. The Gujarat election is seen as a Prime Minister Narendra Modi vs Congress vice president Rahul Gandhi duel, with both leading their parties from the front in an aggressive, often bitter and personal campaign, to win the crucial state ahead of next year’s national election. The ruling BJP holds 67 and the Congress 16 of the 89 seats where polling is being held in the first phase. The rest of Gujarat’s 182 constituencies will vote on Thursday next. Results will be announced on December 18. Gujarat saw a 71.32 per cent voter turnout in 2012, when Chief Minister Narendra Modi led the BJP to its fourth consecutive term in power. It was the highest turnout since 1980. The BJP has ruled Gujarat for the last 22 years straight. Gujarat Chief Minister Vijay Rupani was among early voters this morning, asserting that the BJP will win again, “We are very confident, there is no question of any challenge,” he said after casting his vote. Mr Rupani takes on Indranil Rajyaguru, the richest man in the state assembly, in Saurashtra’s Rajkot West in the most closely watched battle today. The Congress’ senior leader Ahmed Patel claimed his party will win more than 110 seats; it needs 92 to form government. But he expressed misgivings over reports of faulty EVMs and alleged, “The BJP is an opportunist. They can do anything to stay in power.” Mr Patel has asked the Election Commission to take “necessary action” about malfunctioning EVMs. The Election Commission has said there were minor problems that were fixed. “There are 24,000 polling booths in Gujarat, the problem has occurred in 7 or 8 booths,” Chief Election Commissioner Achal Kumar Joti told NDTV. “We have a number of EVMs in reserve. Concerned officials keeping continuous check,” he added. Today’s battle for the 12 seats in Surat, the diamond and textile hub and a BJP stronghold, is being seen as a referendum on the notes ban and new national tax GST. Rahul Gandhi has urged traders to punish the BJP, alleging that its mega reforms have brought small business to their knees. Union ministers Arun Jaitley and Smriti Irani have defended the GST and demonetisation, trying to allay the concerns of the traders. Saurashtra and Kutch, which have the maximum number of constituencies that vote today, are also crucial. The party that wins the most seats in these regions will be seen to have a head start. Located on the coast of the Arabian Sea, Saurashtra covers 11 districts has a huge population of the influential Patels or Patidars, who have been demanding that they be included among castes that get benefits of affirmative action. To win the Gujarat elections, a party needs to get a majority in 92 seats. In 2012, the BJP had won 116 seats. Previous articleVirat Kohli and Anushka Sharma to Get Married in Italy on December 15?